Mere Green five hundred years ago was a triangle of waste ground surrounded by farmland. The poor drainage meant that the Green was unsuitable for farming, and there was a large pool, called Mare Pool, in the centre of it. The main Lichfield Road ran across the green and Belwell Lane led from it towards Four Oaks, but Mere Green Road was then only a footpath through the fields. The surrounding fields were farmed by the villagers of Hill Village and Little Sutton - one of the medieval open fields of Hill Village was bounded by the Green; this open field was anciently known as Mare Field, and so the green was known as Mare Green because it was next to Mare Field. Over the next two centuries Mere Green shrank as parts of it were taken in for cultivation or encroached on by squatters. The first detailed plan of the area in 1811 shows a dozen buildings at the edges of the green, including two blacksmith’s workshops and the workshops of a nailer, a wheelwright and a carpenter; Mere Green Road is shown following the twisty course of the old field path. Lichfield Road had recently been taken over by a Turnpike Trust, and still followed the course of Hill Village Road, but in 1827 the Trust built a new road ( the present Lichfield Road) to by-pass Hill Village. The Barley Mow public House in Hill Village Road lost much of its trade when traffic no longer passed its doors, and soon moved to new premises at Mere Green on the site of one of the larger encroachments alongside the turnpike road. In 1824 all the common lands in Sutton were enclosed and the development of Mere Green began in earnest. Mere Green was now Corporation land, and soon the pool was drained and a new elementary school built there in 1826, to be followed later in the century by more schools and some almshouses. A row of cottages called Primroses occupied the site of the Somerfield supermarket, and then in the early years of the twentieth century the distinctive mock-tudor range fronting the traffic island was built. What next for Mere Green? Plan of Mere Green in 1824, showing field boundaries and buildings. The earlier extent of the Green is shaded yellow. 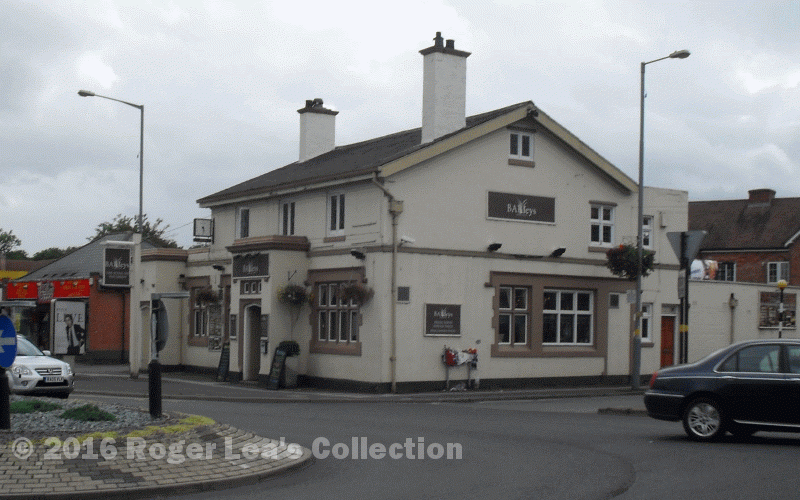 The Barley Mow as it is today.